BROOKLYN MUSEUM PRESENTS “IMPRESSIONISM AND THE CARIBBEAN” EXHIBIT | STREETS OF NEW YORK 411 INC.
Eighty-four paintings and works on paper by Oller, his predecessors, and his contemporaries in the Caribbean, Europe, and the United States will be on view from October 2, 2015. through January 3, 2016, at the Brooklyn Museum. This exhibition brings together masterpieces from the Museum’s collection and paintings from private collectors and museums in Paris, Puerto Rico, Miami, Washington, D.C., and the New York City area. The exhibition examines the exchange between Europe and the Caribbean in the eighteenth century and presents the Caribbean as a region of intense creativity (where local artists intermingled with those from abroad) from the eighteenth to the twentieth century. The European and North American presence and influence is represented through works by such eminent artists as Camille Pissarro (an intimate friend of Oller in Paris) and Frederic Edwin Church, among many others. The exhibition celebrates Oller’s important contributions to both the Parisian avant-garde and the Puerto Rican school of painting within a larger artistic, geographic, and historical context. Included in the exhibition is a plein air portrait of Oller’s friend Paul Cézanne, illustrating Oller’s place in avantgarde circles abroad and highlighting his embrace of Barbizon school painting practices. Also featured is Oller’s mature masterpiece Hacienda La Fortuna, an Impression-inspired depiction of one of southern Puerto Rico’s large sugar-mill complexes. Oller was commissioned by the Barcelona émigré José Gallart to paint a series of “portraits” of his five Puerto Rican sugar plantations. This landscape is an early morning view of Gallart’s most significant plantation, showing rural Afro–Puerto Rican laborers gathering sugar cane in the foreground and the planter’s home, flanked by his warehouses (former slave quarters) and his sugar mill, in the middle distance. Oller had much in common with artists from Europe and other parts of the Caribbean. Nonetheless, Puerto Rico served as his most important source of inspiration. 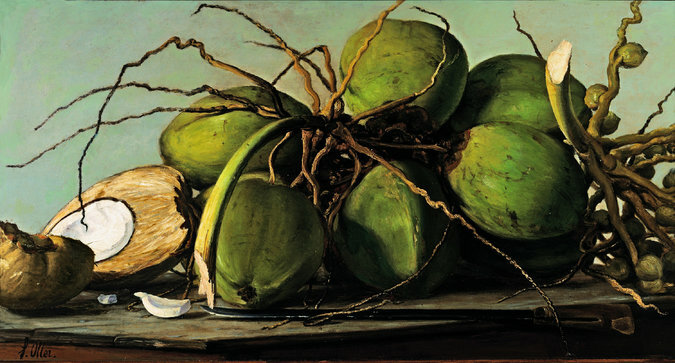 This deep connection is observed in his iconic paintings of tropical landscapes, still lifes with local fruits and vegetables, and portraits of the island’s distinguished artists, teachers, and intellectuals. Oller was an artist with a highly developed social consciousness, and his key role in educational reform is attested to by the many schools he founded on his island—several of which were tuition-free and open to women—and his influential treatises on art and ethics. Oller trained first in Puerto Rico, then in Spain under the painter Federico de Madrazo, and finally in France in the celebrated Paris ateliers of Charles Gleyre and Thomas Couture. In the French capital, he joined the avant-garde circles of Gustave Courbet, Pissarro, Cézanne, Claude Monet, and Pierre-Auguste Renoir and exhibited, as “a disciple of Courbet,” at the annual Salon exhibitions and the 1875 Salon des Refusés. Oller’s twenty-one years in Europe informed his novel Realist-Impressionist idiom, which he transmitted to his students and other painters in Puerto Rico and Cuba. In addition to iconic paintings by Oller, the exhibition includes rarely seen watercolors of the Caribbean by Winslow Homer, portraits of prominent Spaniards in late eighteenth-century San Juan by the Afro–Puerto Rican master José Campeche, and portraits of British Jamaican sugar planters by Benjamin West. Also featured are paintings by Oller’s contemporaries in Paris—Couture, Courbet, Jean-Baptiste-Camille Corot, Cézanne, Alfred Sisley, and Monet, among many others—that enrich our understanding of Oller’s unique approach to international modernism. After its presentation at the Brooklyn Museum, Impressionism and the Caribbean: Francisco Oller and His Transatlantic World will travel to the Museo de Arte de Puerto Rico in San Juan, where it will be on view from January 29 through April 24, 2016. Impressionism and the Caribbean: Francisco Oller and His Transatlantic World is organized by Richard Aste, Curator of European Art at the Brooklyn Museum, and Edward J. Sullivan, Helen Gould Sheppard Professor of the History of Art, New York University. Generous support for this exhibition is provided by the National Endowment for the Arts and Christie’s. Additional support is provided by Carmen Ana Unanue, Salomé Galib and Duane McLaughlin, Julius Leiman-Carbia and Kyle T. Smith, Dr. Blas Reyes and Dr. Hilda Capo, and the Norman and Arline Feinberg Exhibition Fund. The exhibition’s sponsor is Univision. Edward J. Sullivan’s book From San Juan to Paris and Back: Francisco Oller and Caribbean Art in the Era of Impressionism, published by Yale University Press, will accompany the exhibition. Admission: Contribution $16; students with valid I.D. and seniors $10. Ages 19 and under FREE. Group tours or visits must be arranged in advance by calling extension 234. Museum Hours: Wednesday and Friday, 11 a.m. to 6 p.m.; Thursday 11 a.m. to 10 p.m.; Saturday and Sunday, 11 a.m. to 6 p.m.; first Saturday of each month (except September), 11 a.m. to 11 p.m. Closed Monday, Tuesday, Thanksgiving, Christmas, and New Year’s Day.